If you missed the planting of the Vimy Oak Tree yesterday at the Museum, not to fear you can still visit the oak tree at its new home on the museum grounds. We planted the tree across from the English Oak tree planted in 1937 in commemoration of the Coronation of King George VI in front of the majestic county courthouse. The tree is planted with a direct view of our gun which was captured at Vimy Ridge on April 9, 1917 and won by Albert County in the 1919 Victory Loans Campaign. Our Vimy Oak was grown from scions cut from one of the original oak trees grown from acorns gathered at Vimy Ridge in 1917 by Lieutenant Leslie H. Miller. He planted his acorns at his farm in Ontario, which he eventually called Vimy Oaks Farm. After the battle of Vimy Ridge all but one oak tree was destroyed, so the Vimy Oaks Legacy Corporation was formed and began the project to repatriate the Vimy Oaks to Vimy Ridge in 2015. Our tree was originally slated to be planted at Vimy Ridge, but due to soil regulations was unable to be planted there. The project then sent over acorns from the Vimy Oaks in Ontario to France and and are growing them there. Our Vimy Oak tree is one of 250 that are going to be planted across Canada, and was the first to be planted in New Brunswick. The day was made more profound as it was 100 years to the day that Lieutenant Louis Stanley Edgett from Hillsborough, NB died of wounds suffered from a counter-attack at Vimy Ridge on May 10, 1917. You can read more about him here. With special thanks to the people who made this project possible: The Liptay Family for purchasing the tree, Jim Landry at Landscape NB/PEI for having the foresight to obtain 40 trees for NB and PEI, Kim Wilmot of Ayles Natural Landscaping from Riverview for helping with the planting and subsequent care of the tree and the Vimy Oaks Legacy Corporation for making the whole thing possible. 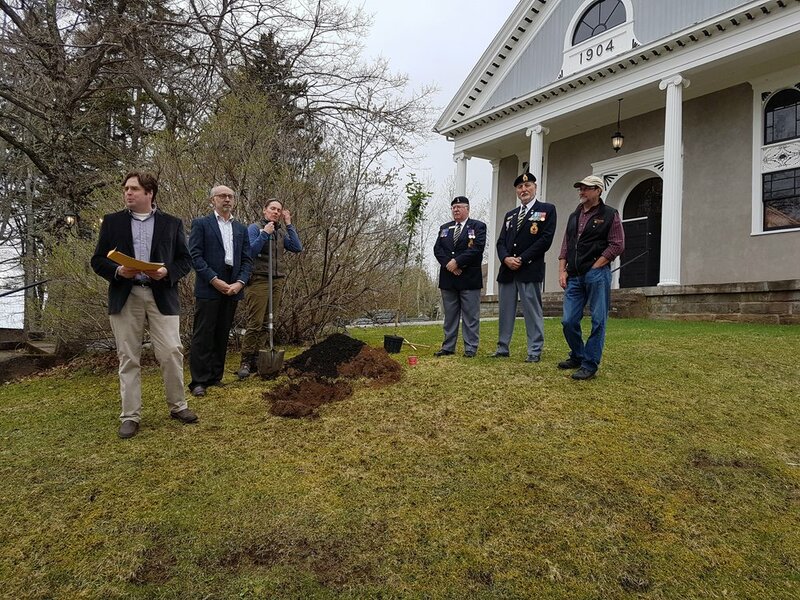 Thanks to the large number of people who attended the planting, along with the dignitaries present, our MLA Brian Kierstead, and representatives from the Hillsborough Legion Branch 132 President Keith Steeves, and Riverview Veterans Association President Peter Jubb. CTV ATlantic did a Great story on the planting and it can be found here.